The Digital Business Platform (DBP) has emerged as the most effective way to support digital transformations and simultaneously reduce costs. Aragon Research evaluates 27 key providers who are leading the charge in the DBP market. A critical step in choosing a Digital Business Platform is first examining which customer experiences, processes, decisions, and associated resources should be fully digital. 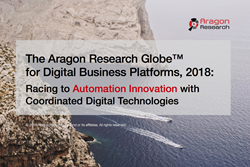 Aragon Research, a technology-focused research and advisory firm committed to providing thought-leading visual research and trusted advisory services, announced the publication of its first ever Globe report for Digital Business Platforms (DBP). DBPs coordinate goal-directed work and support interactions between people, software, and machines in a most intelligent manner. As organizations begin to retire their legacy platforms, and as these platforms deteriorate over time, they will need to leverage a Digital Business Platform in order to support their transformation initiatives. While building a platform from scratch is a viable option, most organizations do not have the time or capital to spend on building their own, and will look to purchase one instead. Aragon advises organizations to look for Digital Business Platforms that have: work management capabilities, smart/teachable capabilities, universal big and fast data and ecosystem linkage capabilities, machine and sensor management, reusable application function, emerging technology inclusion, and security administration. The 2018 Aragon Research Globe for Digital Business Platforms evaluates 27 providers in the market and overviews key trends that are fueling the growth of DBPs in the enterprise. Executive leaders should use this report as a resource as they begin their DBP selection process. The providers evaluated in this report include Adobe, Appian, AuraPortal, Bizagi, Bonitasoft, Bosch, Cisco, GE, Genpact, Google, IBM, Intel, ITESOFT/W4, iVEDiX, K2, Kofax, Microsoft, Nintex, Nvidia, Oracle, Pegasystems, Red Hat, Salesforce, SAP, Software AG, TIBCO, and XMPro. Aragon clients can learn more in the Aragon Research Globe for Digital Business Platforms, 2018. Aragon Research is the newest technology research and advisory firm. Aragon delivers high-impact visual research, consulting, and advisory services to provide enterprises the insight they need to make better technology and strategy decisions. Aragon Research serves business and IT leaders and has a proven team of veteran analysts. For more information, visit https://www.aragonresearch.com/.